V.com weekend vote: Do you favor traditional or geared pegs? December 2, 2016, 8:35 AM · When it comes to geared pegs, a defining moment for me was when Elizabeth Pitcairn announced at a gathering of violin makers that she had installed Wittner Fine-Tune Pegs -- in her 1720 'Red Mendelssohn' Stradivarius! To explain: traditional wooden pegs use friction to stay in place. Gear pegs contain small mechanical gears inside, making them very easy to turn and less likely to slip. Having grown up with mismatched, constantly-slipping pegs in my violin that required constant struggle, I came to view myself as kind of a peg warrior. That is right, after all that difficulty, the traditional pegs on my violin, or on just about anyone's, are a breeze for me. But why all the suffering? As Elizabeth said, "It takes the strength of a butterfly to turn these pegs!" I gave my blessing to several of my students to get the geared pegs, and they certainly have no trouble tuning their instruments. Laurie's Violin School: Don't Tolerate Impossible Pegs! Discussion: Why not install Planetary Pegs? December 2, 2016 at 04:06 PM · I selected traditional because that is what I have and I have no experience with geared pegs. 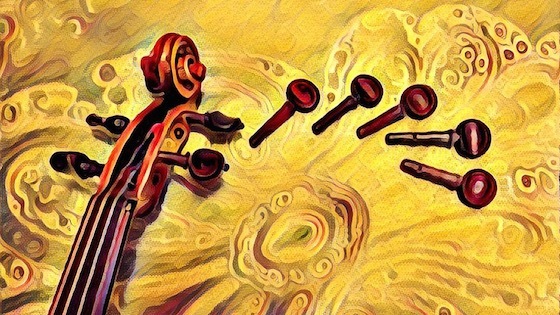 Though I also have "non-traditional" friction pegs - Roth-Caspari's - on one violin and would happily experiment except for the cost of the pegbox rebuild required to make the change. December 2, 2016 at 04:57 PM · I have voted "Traditional pegs with E-string fine-tuner" because that is what I use myself and have always done. But for my violin pupil's instruments I would actually like to have the gear pegs. It is not something I have considered until I saw this article. For the pupils, and I am talking about children now, it is not possible to turn the traditional pegs. It is a matter of physical strength. I work on a music school. It would be a great idea to have all the music school's small violins equipped with gear pegs. I wonder if you can even get them in small sizes. December 2, 2016 at 05:38 PM · On violin and viola, I don't see the need to change to geared pegs but I've taken up viola da gamba and I broke my left ring finger last year so it's hard to tune anything with my left hand. I'm considering geared pegs for the viol. December 2, 2016 at 07:59 PM · I'm fine-tuner dependent. Quite honestly, I can't go without them. Even though I can make big adjustments with the traditional pegs and the pegs are in reasonably good shape (I'm using synthetic strings), I find it too difficult to bow and turn pegs and tune accurately and quickly. December 2, 2016 at 08:36 PM · I've had a couple students now with instruments that have Knilling and Wittner pegs installed, and they work very well. Double Bass players have enjoyed the benefits of mechanical pegs for quite some time, and it's really nice to see them making inroads for the smaller instruments. December 2, 2016 at 08:44 PM · Traditional pegs with E-string fine-tuner. So I'm with the majority -- 70% of 30 votes at this hour. No experience with geared pegs, so I can't offer a comparison. I grew up with regular pegs and the E-string fine-tuner. With modern conveniences like peg dope, I've managed well -- with three fiddles currently active -- and can't really find a reason to change now. Instructional videos, with their do's and dont's on how to install strings and prevent slippage, have helped, too. December 2, 2016 at 08:53 PM · "Geared pegs" all the way as in the ones that look like traditional pegs with the gears inside the peg. Traditional pegs seem always to be a hassle even when they are exceptionally done. Sorry to all the luthiers out there, but as a player, they just are. It started for me when I was playing a gig (in the winter) and at a break, left my "good" violin on a table that was too near an uninsulated window (duh) and when I returned, three of the pegs had sprung. Argggg! So I eventually bought a violin that came with the geared pegs already installed from the factory for gigs such as this. Not the greatest violin but decently adequate for the jobs at hand. Love at first tune! And the pegs pretty much stayed in position despite weather or humidity. I liked them so much that I got a peg reamer and learned to install them myself and now have them on all my violins and, to be honest, unless I tell my fellow players they are none the wiser. One caveat is that the geared pegs (shafts) do come in different diameters(mm) beyond standard so measure your current pegs. I had a couple of older violins (peg holes worn over the years before I got them but not needing a rebushing) and an relatively new electric violin that required larger sized diameter(mm) shafts. December 2, 2016 at 11:07 PM · Wittner gear pegs were factory-installed in Germany on my Mezzo-Forte carbon fiber violin. All 4 strings, and no need for E string fine tuner. Ratio 8.5:1.....these have been working fine the past 11 months that I've had the fiddle. December 3, 2016 at 12:22 AM · I have traditional pegs with fine tuners. It's just turned very hot here (in Australia) and my pegs are slipping and not staying in place - so frustrating - spending ages trying to tune before I start to practice. I thinks gear pegs would be wonderful and I plan to get them ...sooon. December 3, 2016 at 12:47 AM · Wittner geared pegs for me on all my violins. I got tired of the traditional pegs popping out during the hot and humid summer months here. Ella : the geared pegs also eliminate the need for fine tuners as the gear ratio is 8.5:1 . December 3, 2016 at 03:04 AM · Geared pegs, hands down. December 3, 2016 at 06:23 AM · I voted for geared pegs but I still always use regular pegs with tuners on all the strings. How much are the geared pegs and where does one get them? December 3, 2016 at 06:10 PM · Nancy, a set of Knilling pegs can be ordered on Amazon, so you can look at the price there. But order them through your luthier so that they can measure your peg holes and get the right size. And of course ask the luthier's advice about whether your violin is suitable for the changeover, which most violins will be. For a luthier the install is very very easy so I would estimate no more than an hour of labor. I have one set of each brand -- pegheds in my violin, knillings in my daughter's violin, and wittner finetune in my viola. I like the Pegheds the best, because they look beautiful in addition to their excellent function. For pure function the wittners are best. After 95 votes, I see 17% with some form of geared pegs. Impressive! December 3, 2016 at 06:59 PM · Paul, do you find that either of yours turn in increments instead of perfectly smoothly? December 3, 2016 at 11:43 PM · Traditional setup with friction pegs and e tuner was a standard when most violins used gut wound strings. Modern strings have much less stretch, and are much more difficult to accurately tune with friction pegs. I have used geared Perfection Pegs for years, and they work especially well both in hot and humid conditions, and cold and dry conditions. In my shop, I am installing Perfection pegs 4:1 over traditional pegs. December 4, 2016 at 03:45 AM · Laurie, no, they all turn smoothly. If there is any jerk in the motion, it is only if you start by drawing toward higher pitch, which I believe is due to the release of static friction of the string against the nut groove. One never experiences that with a traditional peg because the static friction of the peg itself is always much greater. If you bear down very hard on the gear peg (for instance, because that's what you're used to doing with a friction peg), then you can cause it to grind a little against itself which can feel a bit like it's turning in increments. But the mechanism intrinsically is not incremental, as far as I know. All these problems are alleviated by just getting used to geared pegs and understanding that they function differently toward the same end. Turn down (toward lower pitch) at the start to release the nut-groove static friction, and then draw up. Once you get the hang of it, which takes maybe a dozen tunings, you'll rarely have to draw up twice. Perfection Pegs have a feature where you can change somewhat the "tightness" of how they feel by pushing in on them, and if you don't push in at all, over time they can work their way out to where they feel very loose. They still won't slip, but they just feel wrong. So most Perfection Peg (and PegHeds) users will push in just a little as they tune. With Wittner Finetune pegs you don't push in at all. You just turn the peg, that's it. The best way to try them is to ask a colleague in your orchestra who has gear pegs to let you take them for a test drive. Ask if you can try tuning their violin. December 5, 2016 at 02:09 AM · I chose Perfection pegs because I use them on my viola. My luthier told me that many violinists use these pegs on their violas because the viola pegs are more difficult to adjust than violin pegs. On my violin, my primary instrument, I use standard pegs with fine turners for all four strings. December 5, 2016 at 06:19 AM · No regrets after 5 years with the Wittner pegs! I only have them in my borrowed instrument, a Stradivarius, and everyone who tries the instrument delights in the pegs as well. December 5, 2016 at 05:10 PM · Pauline, when I first got my viola, the wooden pegs turned like a dream. That lasted about three months. And I don't think I'm wrecking my pegs either. But it didn't matter because I had already planned to put in gear pegs with my first change of strings. I had Wittners installed by Patrick Toole (Roanoke Va). Patrick has done more than 100 gear peg installs. They work perfectly.